Yesterday, the Sacred Heart of Jesus Christ cemetery in Ukkinadka was vandalized. On 10 April a pastoral center was attacked, where 150 students were in retreat. On Holy Saturday, an Orthodox priest was insulted and a church damaged. Sajan K George: "A surge in hostile acts against Christians". 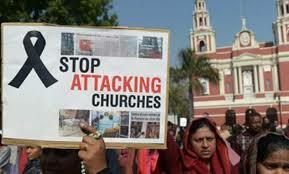 Mumbai (AsiaNews) - In April, which began only two weeks ago, three attacks against Christian places of worship have already taken place in the Indian state of Kerala, Sajan K George, president of the Global Council of Indian Christians(GCIC), reports to AsiaNews. The Christian leader complains: "The GCIC condemns these acts of vandalism, which offend our [religious] sentiment". The most recent episode took place yesterday, when some unknown criminals entered the cemetery of the Sacred Heart of Jesus Christ in Ukkinadka, in the district of Kasaragod, and destroyed the cross that stood in the burial place. Then the vandals damaged another seven tombs. On April 10, another attack against the "Logos Pastoral Center", in the diocese of Neyyattinkara. At the time of the accident, the center housed about 150 students of the 12th class in retreat. They were accompanied by a priest and two nuns. The Christians were attacked by at least 500 people, "disturbed" by the religious songs that were being sung. Criminals threw stones at the building, shattered windows and entrance doors. Finally, the third incident occurred on the night between March 31 and April 1, Holy Saturday, in the orthodox church of St. Greogrios of Punnamoodu, in the district of Alappuzha. Around 1:30 am Fr. MK Varghese, vicar of the church, was reaching the building to celebrate the Vigil Mass, when some criminals got in front of him and prevented him from entering. Then they also insulted him. Having heard the commotion, the faithful came and managed to save the priest. In the meantime, however, reports Sajan K George, "the villains vandalized the church hall, broke windows and kicked down the door. The police arrested three people, who justified themselves by claiming that [the vicar] wanted to buy land for the cemetery. " The president of the GCIC reports that "the surge in hostile acts and intolerance towards Christians is alarming. Although it appears that the attacks are not directed specifically against the faith, there is a certain intolerance towards everything that is related to Christians. This is harmful for the democratic and secular India, while the social fabric of our country is damaged by insensitive comments or provocative statements, false and without foundation against the missionary work of Christians. We see the consequences in these April incidents." The tiny Christian community, he concludes, "is an easy target for extremist forces, and this causes insecurity and fear among Christians"